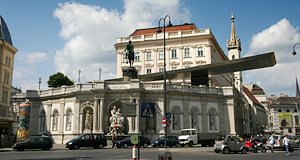 One of the World′s most extensive collections of graphic art is presented in one of the weirdest buildings of Vienna: The Albertina is housed in what used to be the foundation of a Augustinian monastery, later a palace and a bastion that helped to secure the Hofburg Palace, to which it is connected. To make it even stranger, a massive horse-and-rider monument of Archduke Albrecht was added in the 19th century. Albrecht was a victorious general in the Austrian-Prussian war of 1866, resulting in Austria′s exclusion from the German federation and opening the way for Prussia to unite a new Germany under its rule. Finally, a few years ago, the Albertina received an outdoor-escalator and a very odd-looking, but not unattractive roof-like structure, finally making the building a cocktail of styles. From the equestrian statue, you can get a nice view on the Staatsoper and the Hotel Sacher as well as the "Denkmal gegen Krieg und Faschismus" ("Memorial Against War and Fascism") by the eccentric Viennese artist Alfred Hrdlicka (try to say this when you are drunk). It is situated on the site of the "Philippihof" ("Philip′s Court"), a jockey club from the second half of the 19th century. One night during WWII, hundreds of Viennese gathered in its basement that served as a bomb shelter. The court received two direct hits and several hundred people (the exact number is unknown) died, many of who were never recovered from the site. Many tourists mistake the Jew on the ground as a hint that the memorial commemorates the Jewish victims of the Holocaust - which is not the case that one is on the Judenplatz further inside the first district. Back to the Albertina. It was founded in 1768 by Duke Albrecht von Sachsen-Teschen, after whom the museum was named. Today, it owns a collection of more than 50,000 drawings, sketches and water colours as well as some 1.5 million sheets of printed artwork like etchings. Raphael, Rembrandt, Dürer, Schiele, Rubens, Bosch, Bruegel (several of them), Cezanne, Picasso, Matisse, Kokoschka, Klimt, Michelangelo, da Vinci - the collection′s catalogue reads like the "Who is Who" in the history of art. Since graphic art is very vulnerable and sensitive to light - and due to the sheer size of the collection - only a small part of the collection is actually on display on any given point. Temporary exhibitions are the way forward for the Albertina, and they can be enormously popular - I can recall a Dürer exhibition that turned into a national event. The galleries were renovated only a few years ago and the entire building is in very good shape. Nearby attractions include obviously the Hofburg and the Augustinerkirche Church, the National Library, the Stallburg and the Burggarten, to which the building is attached, but also a whole bunch of other nearby museums: The Kunsthistorisches and Naturhistorisches Museum, the Staatsoper with its own museum, the Jewish Museum, the Film Museum, the Theatre Museum, the Academy of Fine Arts, the Emperors′ Tomb with the remains of several dozen Habsburg rulers. The Stephansdom is within walking distance and Karlsplatz with its range of tourist attractions isn′t far either. It′s yours to discover - just follow the crowds or the signs.